Whether you’re new to a real food diet or simply need some fresh ideas, my free real food meal plans make your life easier. Each recipe in this meal planner follows the standards of real food as outlined in one (or more) of the popular real food diets: Real Food: What to Eat and Why , Nourishing Traditions , the Paleo diet , the Whole 30 Diet , the Ketogenic die t, and/or the Primal Blueprint . I highly recommend using the meal planning service PlanToEat to keep track of your recipes through the week. 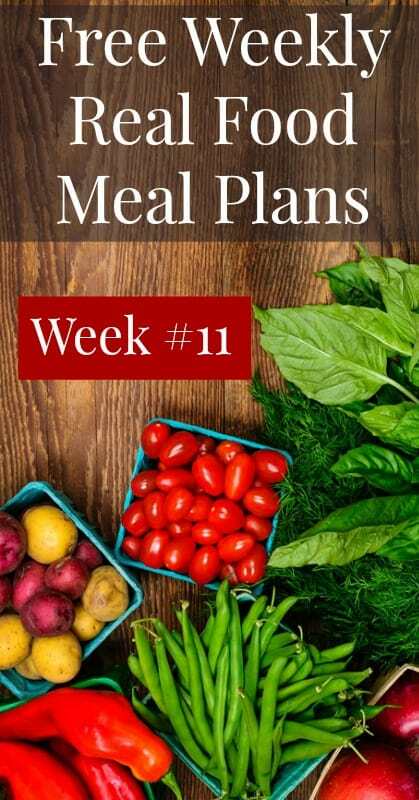 Important Note: Unless you’re cooking for a large family, this meal plan contains too much food for a realistic week. The point of my free real food meal plans is to give you a large number of real food recipes to add to your digital recipe box. You get 294 carefully curated real food recipes. It’s entirely your choice to plan for leftovers, to skip recipes, to repeat your favorites from previous weeks, or to follow the plan exactly. Only you know what will work for you and your family. What about side dishes? Many of the dinner recipes have vegetables included. For those that don’t, I suggest keeping fresh or frozen vegetables on hand to serve with the main dish. Now, let’s get right to this week’s free real food meal plans.